Mass celebrated at Saint John Gualbert Cathedral, Johnstown, PA, by Bishop Mark L. Bartchak of the Diocese of Altoona Johnstown, PA. Music by Cathedral Organ and Small Chamber Orchestra. Click triangular play button to watch video of the full Catholic Mass. Volunteers come together each week to make possible the live broadcast of our Sunday Mass. Our camera operators, sound, and graphic staff, experienced director and skilled engineers all volunteer their time and talent. Our team includes both adults and students. We are extremely grateful for their dedication week after week. Our Mass is broadcast live at 11 AM each Sunday on WATM ABC 23 in Johnstown, PA, and on Cornerstone TV Faith and Family Channel in Pittsburgh. The Mass video is then rebroadcast every Sunday at 9 PM on Atlantic Broadband Public Access Channel 9 in Johnstown. It is repeated on the Faith and Family Channel at 6 PM each Wednesday and at 4 PM each Thursday. Below are videos of past Sunday Masses at St. John Gualbert Cathedral. Mass celebrated at Saint John Gualbert Cathedral, Johnstown, PA, by Bishop Mark L. Bartchak of the Diocese of Altoona Johnstown, PA. Music by Cathedral Youth Choir. Mass celebrated at Saint John Gualbert Cathedral, Johnstown, PA, by Very Rev. James F. Crookston, Rector of the Cathedral. Music by Cathedral Adult Choir. Mass celebrated at Saint John Gualbert Cathedral, Johnstown, PA, by Very Rev. James F. Crookston, Rector of the Cathedral. Music by Cathedral Youth Choir. Prayer of the Faithful and blessing of the parish’s two Elect preparing for the Rite of Christian Initiation this coming Easter. Mass celebrated at Saint John Gualbert Cathedral, Johnstown, PA, by Very Rev. James F. Crookston, Rector of the Cathedral. Music by Cathedral Adult Choir. Includes Birthday Blessing for Josephine Cable, who is celebrating her 100th birthday today, Saint Patrick’s Day. Mass celebrated at Saint John Gualbert Cathedral, Johnstown, PA, by Very Rev. James F. Crookston, Rector of the Cathedral. Music by Cathedral Adult Choir. Today’s celebration includes the Rite of Sending for two persons who are preparing to receive Easter sacraments. Mass celebrated at Saint John Gualbert Cathedral, Johnstown, PA, by Father Sean K. Cody, Chaplain, Conemaugh Memorial Medical Center, and Priest in Residence, St. John Gualbert Cathedral. Mass celebrated at Saint John Gualbert Cathedral, Johnstown, PA, by Very Rev. James F. Crookston, Rector of the Cathedral. Mass celebrated at Saint John Gualbert Cathedral, Johnstown, PA, by Very Rev. James F. Crookston, Rector of the Cathedral. Also includes a brief description and invitation to join the Cathedral ARISE program, beginning March 7, 2019. Mass celebrated at Saint John Gualbert Cathedral, Johnstown, PA, by Bishop Mark L. Bartchak together with several other priests of the Diocese of Altoona Johnstown, PA. Music by Cathedral Adult Choir. Mass celebrated at Saint John Gualbert Cathedral, Johnstown, PA, by Very Rev. James F. Crookston, Rector of the Cathedral. Music by Cathedral Youth Choir. Mass celebrated at Saint John Gualbert Cathedral, Johnstown, PA, by Rev. George M. Gulash, Pastor, Resurrection Parish, Johnstown, PA. Music by Cathedral Adult Choir. Mass celebrated at Saint John Gualbert Cathedral, Johnstown, PA, by Very Rev. James F. Crookston, Rector of the Cathedral. Music by Cathedral Adult Choir. Today’s celebration includes the Rite of Acceptance for several persons who are contemplating conversion to Catholicism. Mass celebrated at Saint John Gualbert Cathedral, Johnstown, PA, by Bishop Mark L. Bartchak of the Diocese of Altoona Johnstown, PA.
Mass celebrated at Saint John Gualbert Cathedral, Johnstown, PA, by Very Rev. James F. Crookston, Rector of the Cathedral. Music by Cathedral Adult Choir. Dance by Le Dance Academie. Mass celebrated at Saint John Gualbert Cathedral, Johnstown, PA, by Very Rev. James F. Crookston, Rector of the Cathedral. Music by Cathedral Youth Choir. Includes Introduction of this year’s Candidates for the Sacrament of Confirmation. Mass celebrated at Saint John Gualbert Cathedral, Johnstown, PA, by Rev. Sean T. Code, Hospital Chaplain, Conemaugh Health System, in residence at St. John Gualbert Cathedral. Music by Cathedral Adult Choir. Mass celebrated at Saint John Gualbert Cathedral, Johnstown, PA, by Very Rev. James F. Crookston, Rector of the Cathedral. Music by Sydney Petro, Psalmist. Mass celebrated at Saint John Gualbert Cathedral, Johnstown, PA, by Very Rev. William E. Rosenbaum, Pastor of Saint Clement Parish, Johnstown, PA. Music by Cathedral Adult Choir. Mass celebrated at Saint John Gualbert Cathedral, Johnstown, PA, by Very Rev. Anthony Francis Spilka, OFM Conv, Pastor of St. Francis of Assisi Parish, Johnstown and Diocesan Vicar for Religious. Kelli and Kevin Slonka, Cantors and Kathleen Bumbernick, Pianist. Mass celebrated at Saint John Gualbert Cathedral, Johnstown, PA, by Rev. Chuck Bridges, Parochial Vicar of St. John Gualbert Cathedral in Johnstown, PA, and Operations Manager of Proclaim TV Ministry. Mass celebrated at Saint John Gualbert Cathedral, Johnstown, PA, by Very Rev. James F. Crookston, Rector of the Cathedral. Music by Cathedral Adult Choir. Annual “Blue” Mass offered for the Safety and Protection of First Responders and Emergency Workers in our Community. Mass celebrated at Saint John Gualbert Cathedral, Johnstown, PA, by Very Rev. James F. Crookston, Rector of the Cathedral. Music by Kelli and Kevin Slonka. This Mass includes Invitation to ARISE Program by Larry Olek, one of six leaders of the parish ARISE Program. Mass celebrated at Saint John Gualbert Cathedral, Johnstown, PA, by Very Rev. Daniel J. O’Neill, VF, Pastor of Saint Peter Parish in Somerset, PA and Dean of the Southern Deanery, Diocese of Altoona-Johnstown. Mass honors the Ancient Order of the Hibernians. Mass celebrated at Saint John Gualbert Cathedral, Johnstown, PA, by Rev.Chuck Bridges, Parochial Vicar of St. John Gualbert Cathedral in Johnstown, PA, and Operations Manager of Proclaim TV Ministry. Mass celebrated at Saint John Gualbert Cathedral, Johnstown, PA, by Rev. William E. Rosenbaum, Pastor of Saint Clement Church, Johnstown, PA. Music by Cathedral Adult Choir. 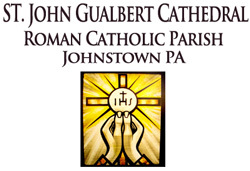 Mass celebrated at Saint John Gualbert Cathedral, Johnstown, PA, by Very Rev.James F. Crookston, Rector of St. John Gualbert Cathedral in Johnstown, PA.
Mass celebrated at Saint John Gualbert Cathedral, Johnstown, PA, by Very Rev. Jonathon J. Dickson, Parochial Vicar at our Lady of Mercy Parish in State College, PA.
Mass celebrated at Saint John Gualbert Cathedral, Johnstown, PA, by Very Rev. James F. Crookston, Rector of the Cathedral, with Mission Appeal by Charles Carr of Philadelphia, who works with Hands Together, a Catholic Mission helping the poorest of the poor in Haiti. Music by Cathedral Adult Choir. Mass celebrated at Saint John Gualbert Cathedral, Johnstown, PA, by Very Rev. Neil R. Dadey, VF, Pastor of Our Lady of Victory Parish, State College and Dean of the Northern Deanery. Music by Cathedral Adult Choir. Mass celebrated at Saint John Gualbert Cathedral, Johnstown, PA, by Very Rev. James F. Crookston, Rector of the Cathedral. Music by Cathedral Youth Chorale. Mass with First Holy Communion Classs of 2018 celebrated at Saint John Gualbert Cathedral, Johnstown, PA, by Very Rev. James F. Crookston, Rector of the Cathedral. Music by Cathedral Parish Adult Choir. Mass celebrated at Saint John Gualbert Cathedral, Johnstown, PA, by Very Rev. James F. Crookston, Rector of the Cathedral. Music by Cathedral Parish Adult Choir. Mass celebrated at Saint John Gualbert Cathedral, Johnstown, PA, by Father Malachi Van Tassell, TOR, President of Saint Francis University, Loretto. Music provided by Cathedral Parish Adult Choir. Mass celebrated at Saint John Gualbert Cathedral, Johnstown, PA, by Very Rev. James F. Crookston, Rector of the Cathedral. Music provided by Cathedral Parish Adult Choir. Mass celebrated at Saint John Gualbert Cathedral, Johnstown, PA by Bishop Mark Bartchak, JCD. Music provided by Cathedral Parish Adult Choir. Mass celebrated at Saint John Gualbert Cathedral, Johnstown, PA by Very Rev. James F. Crookston, Rector of the Cathedral. Music provided by Cathedral Parish Adult Choir. Mass includes Rite of Sending Parish Candidates for the Sacrament of Confirmation. Mass celebrated at Saint John Gualbert Cathedral, Johnstown, PA by Very Rev. James F. Crookston, Rector of the Cathedral. Music provided by Cathedral Parish Adult Choir. Mass celebrated at Saint John Gualbert Cathedral, Johnstown, PA by Very Rev. Anthony Francis Spilka, OFM Conv, Pastor of Saint Francis Assisi Parish, Johnstown and Vicar for Religious, Diocese of Altoona-Johnstown. Music by Cathedral Youth Chorale. Mass celebrated at Saint John Gualbert Cathedral, Johnstown, PA by Very Rev. James F. Crookston, Rector of the Cathedral. Mass includes introduction and affirmation of five candidates for the Rite of Christian Initiation. Mass celebrated at Saint John Gualbert Cathedral, Johnstown, PA by Very Rev. James F. Crookston, Rector of the Cathedral. Catholic Mass on Sunday, February 4, 2018, Fifth Sunday in Ordinary Time. Mass for Consecrated Life celebrated at Saint John Gualbert Cathedral, Johnstown, PA by Bishop Mark Bartchak, JCD. Catholic Mass on Sunday, January 21, 2018, Third Sunday in Ordinary Time. Catholic Mass on Sunday, January 14, 2018, Second Sunday in Ordinary Time. Mass celebrated at Saint John Gualbert Cathedral, Johnstown, PA by Father Chuck Bridges. Catholic Mass on Sunday, January 7, 2018, Feast of the Epiphany of the Lord. Catholic Mass on Sunday, December 31, 2017, at St. John Gualbert Cathedral, Johnstown, PA.
Feast of the Holy Family Mass is celebrated by Very Rev. James F. Crookston, Rector, St. John Gualbert Cathedral. Music provided by the Cathedral Parish Adult Choir. Catholic Mass on Christmas Day, December 25, 2017, at St. John Gualbert Cathedral, Johnstown, PA.
Mass is celebrated by Most Rev. Bishop Mark Bartchak, Bishop of the Diocese of Altoona – Johnstown, PA.
Catholic Mass Fourth Sunday of Advent, December 24, 2017, at St. John Gualbert Cathedral, Johnstown, PA.
Mass is celebrated by Very Rev. James F. Crookston, Rector, St. John Gualbert Cathedral. Catholic Mass Third Sunday of Advent, December 17, 2017, at St. John Gualbert Cathedral, Johnstown, PA.
Mass is celebrated by Very Rev. James F. Crookston, Rector, St. John Gualbert Cathedral, with music by Parish Adult Choir. At this Mass Le Dance Academie performs under the direction of Artistic Director Anita Lorek. At conclusion of Mass, straw is blessed for parishioners to take home and place in their navitity scenes. Please Note: Due to a technical error, video file above opens and begins to play with a black screen. Please slide control bar forward about 25 seconds to begin the actual video. Sorry for this inconvenience. Catholic Mass Second Sunday of Advent, December 10, 2017, at St. John Gualbert Cathedral, Johnstown, PA.
Mass celebrated by Father Chuck Bridges, with music by Parish Adult Choir, and special guest speaker Rachel Hall, Parish Youth Representative, who describes her experience as part of the delegation from the Diocese of Altoona Johnstown attending NCYC, the National Catholic Youth Conference. Also at this Mass Nolan Mock, a student at Greater Johnstown High School, made the Rite of Commitment for the Sacrament of Confirmation. Catholic Mass Sunday, November 26, 2017, at St. John Gualbert Cathedral, Johnstown, PA.
Soleminity of Our Lord Jesus Christ, King of the Universe, Mass is celebrated by Very Rev. James F. Crookston, Rector, St. John Gualbert Cathedral. Catholic Mass Sunday, November 19, 2017, at St. John Gualbert Cathedral, Johnstown, PA.
Thirty-third Sunday in ordinary time, World Day of the Poor, Mass is celebrated by Very Rev. James F. Crookston, Rector, St. John Gualbert Cathedral. At this Mass five adults are formally welcomed into the Rite of Christian Initiation. Catholic Mass Sunday, November 12, 2017, at St. John Gualbert Cathedral, Johnstown, PA.
Mass celebrated by Very Rev. Daniel J. O’Neill, VF, Pastor of Saint Peter Parish in Somerset, PA. Father O’Neill is assisted by Deacon Ronald Kolonich, with music by Saint Peter’s Parish Choir. Please note: Due to a technical difficulty, the last part of this Mass was unable to be properly recorded. Our volunteer engineers are working to correct this problem before next Sunday’s Mass. We appreciate your understanding. Catholic Mass Sunday, November 5, 2017, at St. John Gualbert Cathedral, Johnstown, PA.
Mass celebrated by Very Rev. James F. Crookston, with music by Cathedral Youth Chorale. Catholic Mass Sunday, October 29, 2017, at St. John Gualbert Cathedral, Johnstown, PA.
Mass celebrated by Father Chuck Bridges, with music by Parish Adult Choir. Catholic Mass Sunday, October 22, 2017, at St. John Gualbert Cathedral, Johnstown, PA.
Mass for World Mission Sunday is celebrated by Very Rev. James F. Crookston. Catholic Mass Sunday, October 15, 2017, at St. John Gualbert Cathedral, Johnstown, PA.
Mass is celebrated by Father Anthony Francis Spilka. Special group attending this Mass are local members of the Catholic Daughters of America. Catholic Mass Sunday, October 8, 2017, at St. John Gualbert Cathedral, Johnstown, PA. This Mass includes Confirmation Rite of Blessing of Ninth Grade Students from the Parish. Catholic Mass Sunday, October 1, 2017, at St. John Gualbert Cathedral, Johnstown, PA.
Catholic Mass Sunday, September 17, 2017, at St. John Gualbert Cathedral, Johnstown, PA.